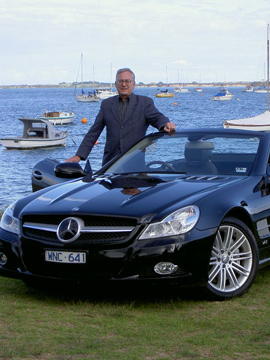 with the Mercedes-Benz SL 600. Some cars are destined to become classics. That's a 'given' in these days when car enthusiasts find it difficult to let go of the past. We all recognise that. Automotive history demonstrates that almost from day one, the Mercedes-Benz SL gained the highly sought after status of 'classic'. The very first SL (Sport Light) dates back to 1952 when the Mercedes-Benz 300 SL began its 'career' when it took Mercedes-Benz into serious motor racing. It was the 300 SL which won the 1952 Le Mans 24 hour race. However, the legendary status came along when, in 1954, Mercedes-Benz unveiled the Mercedes-Benz SL 300 coupe. That was the famous "gull-wing" car. From that time onwards, Mercedes-Benz had an international 'hit' on its corporate hands. The "gull-wing" and the subsequent roadster models continue to be amongst the most admired classics the world has ever known. 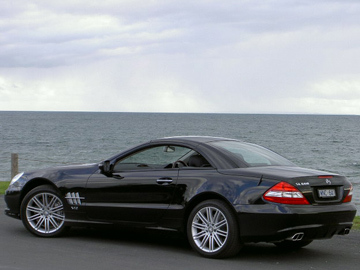 Today, the legend continues with the Mercedes-Benz SL-Class remaining an admired classic. The current model is available, across a broad price range, with a choice of V6, V8 and V12 power plants. This current model differs from previous models in as much as the 'soft-top' of the roadster is replaced by a retractable metal 'hard top'. Perception suggests that the hard top will provide a more 'snug' environment for the fortunate occupants during less favourable climatic conditions (e.g. winter). 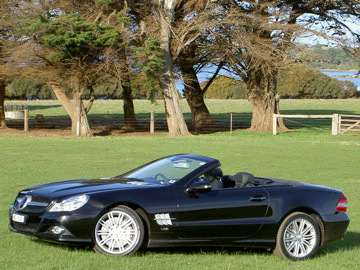 For this report, Next Car road tests the Mercedes-Benz SL 600. This V12 super car is a unique piece of machinery. Priced from $$404,413 (RRP), this particular car was fitted with the optional panoramic glass sunroof (priced at $3,516). 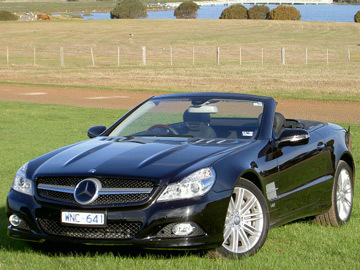 The total price for the SL 600, as tested, was therefore $407,929 (RRP). Powerful V12 engines are relatively rare in cars. Just a 'handful' of examples exist. The V12 in the Mercedes-Benz SL 600 is a 5.5 litre unit, providing 380 kW of power at 5,000 rpm and an amazing 830 Nm of torque at 1,990 to 3,500 rpm. As you would image, this is all the get-up-and-go that anyone will ever require! Whilst a bowl of "Weet-Bix" each morning provides me with my daily get-up-and-go, the SL 600 takes 14.3 litres of premium petrol per 100 kms on average (combined cycle) to keep it going. An 80 litre fuel tank provides a reasonable range for any long distance drives that an SL 600 driver may envisage. 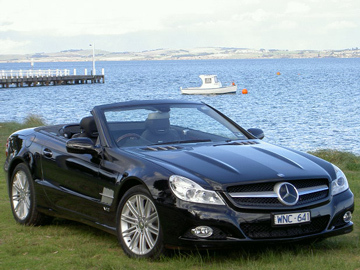 Driving the SL 600 is an easy task and delightful at that. That's because this car is so gentle for an experienced driver to responsibly manage the power whilst attending and enjoying the driving duties. The seating is set low-down, in the traditional sports car manner. Yet the driving position is quite comfortable and, more importantly, it was non-tiring during our drive sessions. Although we managed only 289 kilometres, it was superior comfort all the way. Entry and egress was squeezy in confined spaces (such as a narrow garage), but in open spaces the process of getting in and out of the SL was easy enough. Four way electric adjustment of the steering wheel is possible, thus making a perfect driving position an easy task to set-up. Additionally, the seating is also electrically adjustable and a memory function is included. The 'wheel' has a good feel and it provides good feedback to the driver so that it can be recognised that this Mercedes-Benz has the driver in charge. Wonderful road feel. 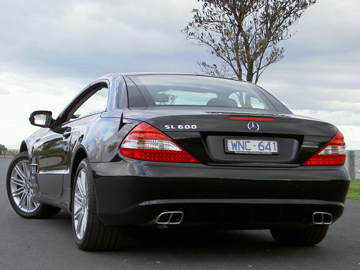 The rear wheel drive SL 600 has a five speed automatic transmission. Whilst some other SLs have a 7 speed unit, the torque rich SL 600 doesn't require a 7 speed transmission. We found the 5 speed unit more than capable of keeping the driving experience fully enjoyable. With 830 Nm of torque, the drivetrain of this SL does the job admirably. 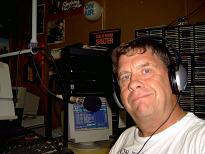 There is no such thing as labouring or vague or unnecessary gear changes. The wheels for the SL 600 are 18 inch 10 twin-spoke light-alloy wheels, the rear wheels being an inch wider than those at the front. Mercedes-Benz quote a figure for the SL 600's performance. Whilst I didn't check it, I believe it. Zero to 100 km/h in 4.5 seconds. That's faster than the Treasurer can justify the obscene tax grab on luxury cars! Have you ever heard a V12? This 5.5 litre 'orchestra' will ring the right note, I'm sure! Don't worry about how it sounds at 5,000 rpm, it sounds good enough at 3,000! The ride was excellent. Sure this is a super car featuring 5.5 litres of V12, but the ride was like a luxury car, rather than a sports car. It felt really good, 100% of the time. The handling was superb. The braking was very effective, just as you would expect from Mercedes-Benz. The parking brake was of the foot-operated variety. This may seem 'old hat', but I quite like such a system. The SL has a under-dash hand-operated release system though. I would prefer the foot-operated variety as well, if it were possible. Driving the SL 600 provided a nice feeling. Without cowl shake of any description, the SL makes 'top down' motoring especially enjoyable. The design, just like the build quality, makes the SL a very good car, indeed. The stylists did a good job, too. Styling aspects from F1 and old SLs make an interesting addition to today's SL. Even with the top 'down', there was still room in the boot for a number of compact overnight bags. The boot lid, by the way, is electrically controlled too, just like the top. None of this manual labour business! For safety sake, Mercedes-Benz has a long and enviable record of championing extensive research into various aspects of vehicle and driver safety. The results of these efforts make it into production models thus making Mercedes-Benz the envy of an industry which has made extraordinary gains with occupant safety over the last ten years or so. 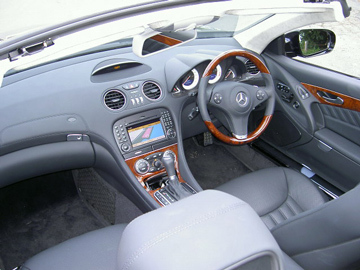 The SL 600, of course, has electronic stability programme (ESP), multiple airbags (frontal airbag for both the driver and passenger plus head/thorax bags) and a roll bar. Naturally, with the Mercedes-Benz SL 600 being a superior model it has plenty of luxury features to 'spoil' the occupants. Standard equipment includes luxury seats (with heating and ventilation) with lumbar support and superb side bolsters, keyless ignition, bi-xenon headlamps, tinted windows, speed-sensitive power steering and satellite navigation system amongst a long list of features. Another feature is the unique "AIRSCARF". Whilst this may seem a novelty, it is a useful luxury that 'blows' warm air from the head restraint towards the occupant's neck. 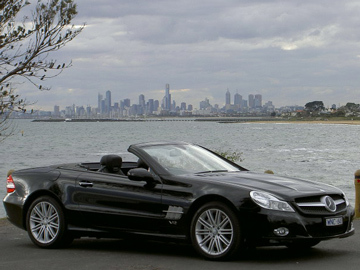 Even though we drove the Mercedes-Benz SL 600 in Melbourne's autumn, we didn't use the airscarf. With the top 'down' (retracted), the turbulence in the cabin are quite acceptable. In addition, a 'draught stop' is included and it is easy to operate, sitting behind the head restraints to assist in guiding airflow above the occupants. The current Mercedes-Benz SL range was 'updated' last year. Thus today's SL will continue its career in local showrooms for sometime yet. But we can be certain, that the SL legend will continue. You can see that with the development of models above the SL by AMG and McLaren. Sports cars are going to figure prominently in the future of Mercedes-Benz for some time to come. With the three-pointed star shining as bright as ever, that serves as good news for sports car enthusiasts worldwide. 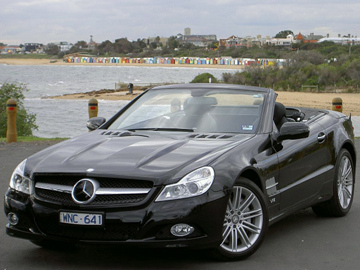 Having enjoyed the Mercedes-Benz SL 600 makes finding fault with it quite a difficult task. Correction, I found it impossible to find fault with this car. At over $400,000 you owe it to yourself to expect quite a lot of this car. The fact is, you can enjoy this car as much as it is possible to enjoy it ..... you just have to drive it and then drive it more! 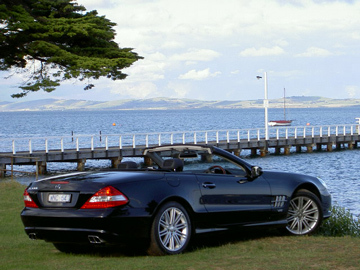 Only a limited number of people will ever own a Mercedes-Benz SL 600. They will be treated to a highly respected, powerful car that will provide enjoyable and endearing driving experiences. Additionally, they will have the satisfaction of being the first with a future classic! It is a tough job, but some-one has to put a future classic on the road today! Although "SL" is a coded message for Sport Light in the annals of Mercedes-Benz, to me the code "SL" simply indicates "Sensational Legend"!